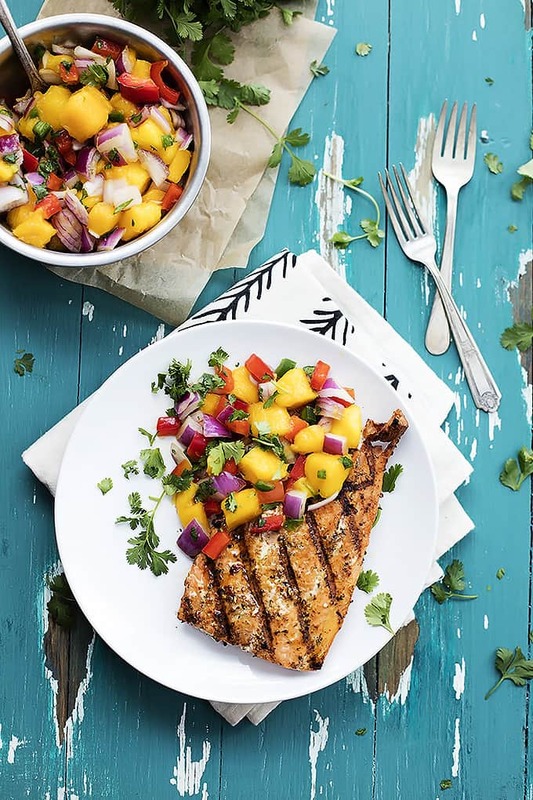 Grilled Salmon with Mango Salsa grilled to flaky perfection and topped with sweet and spicy mango salsa. Sooooo how was your Independence Day?? Lots of tasty bbq yumminess I hope. I indulged in some of the best bbq I’ve ever had the pleasure of tasting, courtesy of my top notch brother in law who smoked some ribs and brisket for the family. I’m trying to convince him to open a BBQ joint. My contribution to the par-tay? Grilled potatoes. Don’t you worry, those beauties are coming very soon my friends, very soon. In the meantime, let’s discuss this salmon. Another grilled bit of yum you’re going to want to try pretty much immediately. The rub for the salmon could not be more simple: salt + pepper + chili powder + garlic powder = done. Just whisk those together, rub them into the salmon, and slap those fillets right on the grill. That would be amazing on it’s own but then we’re gonna top it off with a tropical mango salsa. Sweet n’ savory n’ spicy… everything you could want in a summer dish right on one plate. 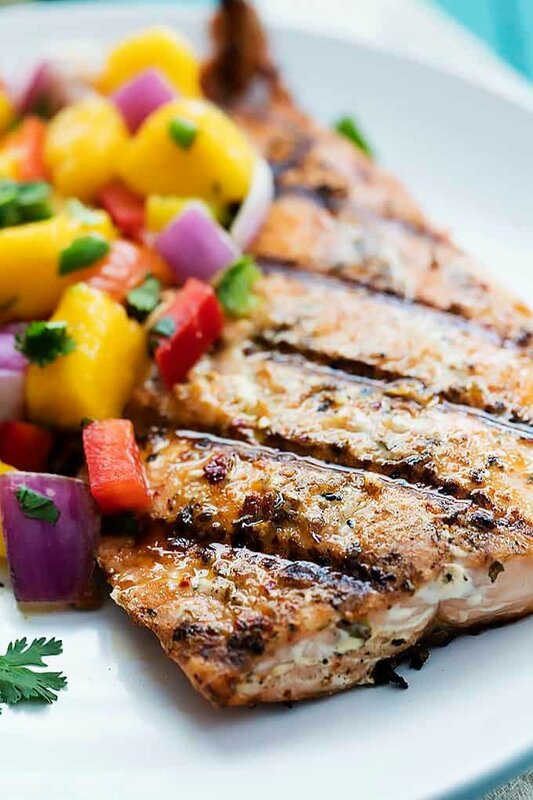 Grilled Salmon with Mango Salsa - perfectly grilled flaky pink salmon topped with sweet and spicy mango salsa. In a medium bowl stir together mangos, red peppers, onions, jalapeños, and cilantro. Set aside until ready to use. Stir together garlic powder, chili powder, and salt and pepper (I used about 1/2 teaspoon each). Rub mixture into salmon fillets. Grill over medium heat for 6-8 minutes on each side. 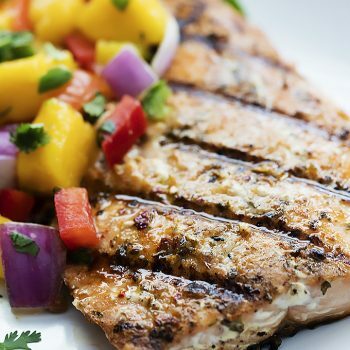 Squeeze fresh lime juice over grilled salmon, then top with mango salsa and serve. More Salmon Recipes you'll love! This looks killer delish! Totally my thing! Thanks Tori!! 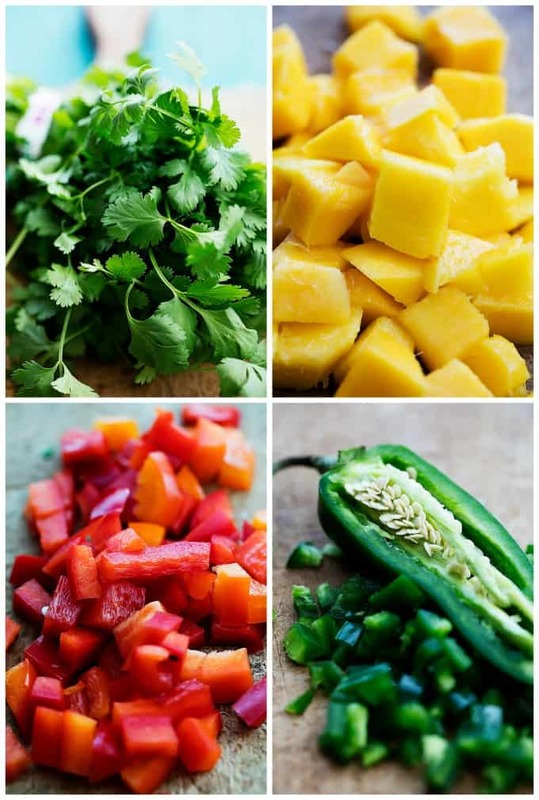 If salmon is your thing… and tropical-ish salsa is your thing… then you will LOVE this!! I have made this Mango Salsa a bit differently. No onion because it is too powerful. Instead I use Jicama. YUM!!! Ooh, jicama would be delicious I bet! I love Salmon, it is my go to fish. I have made mango salsa before and it goes really well with salmon. Your pictures look incredible! Tried this recipe twice now and it has become one of my favourites! So flavourful and healthy! This looks yummy. Will try to make this dish next week what are the nutritional facts? Anyone ever tried this with another fruit? I LOVE this recipe and want to make it for an upcoming dinner soiree but a good friend is allergic to mango and I can’t think of another fruit that would do it justice. Hi Tiffany! I’m getting ready to start Whole 30 tomorrow and I can’t wait to try this recipe! Would this recipe go well if I used a different kind of fish? I’m not a fan of Salmon. Mango salsa can be made in this form too, I was not aware of it. I rarely comment on recipes, but I made this today and it was outstanding! I don’t like cilantro so I omitted it from the salsa (along with the pepper) and added diced avocado and cherry tomatoes instead. I also used frozen mango (defrosted) so less chopping. 🙂 This came together so quickly and was so good. I bet it’d be nice on chicken, too. Served it with buttered green beans and asparagus. Thank you! awesome recipe soon i will try this . i think this will definitely increase the taste of seasonal mangoes. 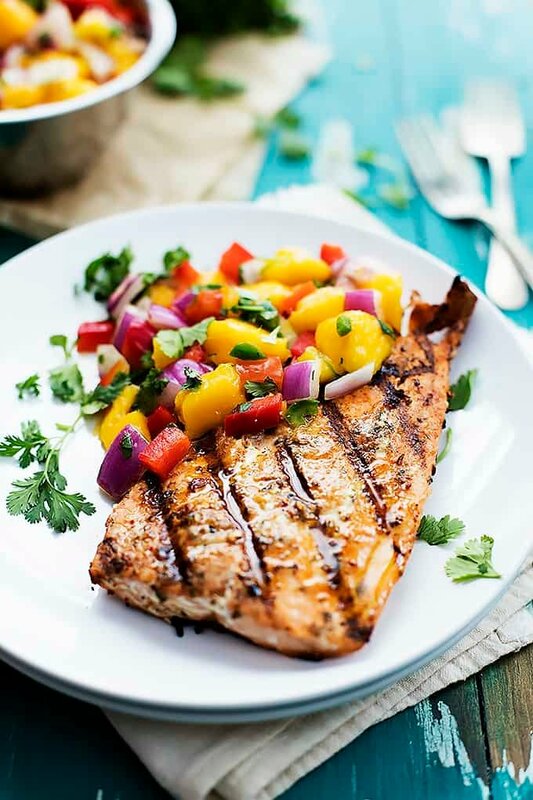 For grilled salmon and mango salsa does mango have be yellow? I gave my coworker the recipe for 26 recipes for whole 30. She say she couldn’t make it. Mango was Green not yellow? Please help. Hi Veronica – any mango will work as long as it is ripe. Thank you for the great compliment! I am so happy to hear that you LOVED this salmon!! It’s super easy, right?! Thanks for the recipe! Made this tonight and the whole family – including my two year old- loved it! Topped the salmon with a little ghee and served with grilled corn to complete the meal. Delicious! Good thinking with adding the ghee, Elizabeth! Thanks for sharing your experience and positive feedback! Happy to hear it was enjoyed by your whole family! I dont usually like to add to much flavor to my salmon and steelhead since i catch them fresh and enjoy the natural taste but, my wife has been begging for mango salsa salmon… i caved and grilled up a couple poinds of last year’s choho after marinading in pinapple teryaki then topped it Off with some mango salsa and i have to say…this is now my second favorite way to prepare salmon! Something about the mango salsa just clicks with the natural fatty wild salmon meat and it blends brilliantly with teryaki also! If you are on the fence like i was, go for it! YOu wont regret it unless you dont like amazingly delicious food! Haha! This comment is the best! I am glad that your followed your wife’s advice! 😉 Thanks for making my mouth water with your amazing description of fresh caught salmon and all!